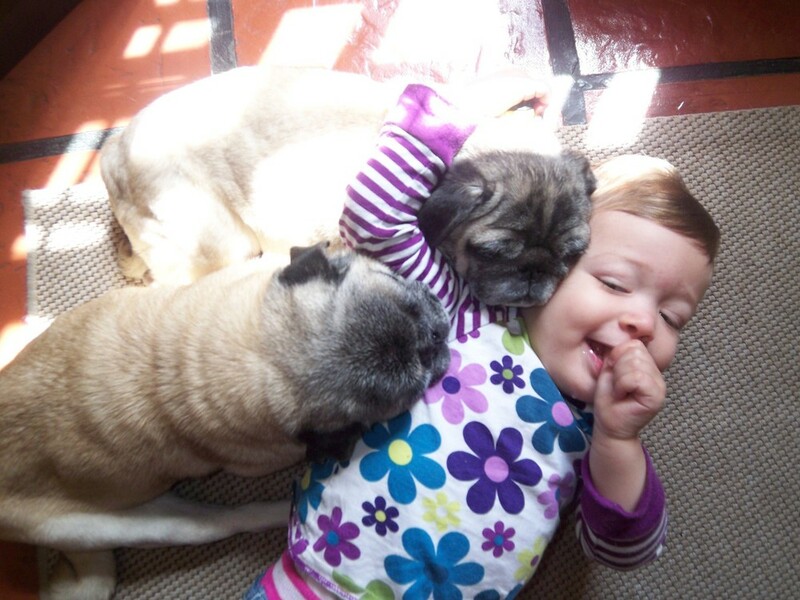 When we moved to Montevideo, Uruguay in March of 2009, we brought our two Pugs, Pablo and Paloma with us. We often joke that they were the most complicated part of the move, requiring specific flight times and layovers (due to temperature restrictions for snub-nose breeds), translated paperwork, exams, shots at very specific intervals, crate requirements, leash, water, tags... the list goes on. For anyone who loves dogs though, this is not even a question. Our dogs were our first babies-before-our-human-babies and although we didn't plan on moving across the globe when we became dog owners early in our marriage, we knew the commitment that dog ownership entails, so 7 years later, the dogs were coming with us. Transit was the easy part. Boarding the dogs in Montevideo another issue all together, but we worked through it and were reunited as soon as we had "our" house in the Pocitos neighborhood. It was wonderful to be together again and the dogs lazed in the sunshine of the courtyard and curled up together wherever they could find a comfy spot. Pablo & Paloma testing a crate. Skip ahead 18 months and we flew with the dogs again on our way to Bariloche, Argentina. This time we knew the drill of traveling with pets and while a bit simpler, Uruguay's pet exportation requirements were still quite detailed. Through Buenos Aires and to Bariloche, our dogs were traveling pros. They loved the freedom of Bariloche and our fenced in yard. Pablo specifically would explore and lay in the gorgeous grass and I'd like to think he appreciated the beautiful views, too. When we drove from Bariloche through Chile and settled in Córdoba, Argentina. We knew that the pugs couldn't take a 15 day road trip with us so we had a wonderful neighbor family in Bariloche watch them. They were caretakers at a gorgeous estate and the dogs were in heaven with a loving family and property to roam. The dogs flew one final time from Bariloche to Córdoba to meet us when we were in our house near the Cerro neighborhood, in the northwest of the Córdoba Capital. Córdoba was to be their final home. Pablo had been in declining health for years. He had lower spine issues and before we even left the USA, we had consults with the University Veterinary hospital, treatments with an alternative medicine Vet (yes, he received doggy chiropractic and acupuncture) and therapy to maintain strength in his hind legs. As he aged, his gait became more and more unstable but he could still walk. As a last-ditch effort, we even used small balloons over his hind feet like booties so he'd gain some traction on our slippery tile floors. Shortly after our second daughter was born at the end of May 2012, Pablo stopped walking completely. He stopped eating and drinking. We took him in to receive IV fluids, but he was 12 years old and his time was up. On our most recent trip to Bariloche this past February 2014, we stayed at the same house where we used to live and buried Pablo's ashes under a prominent tree that he loved to hide under 2 years earlier. We still had Paloma, the younger of the two. A year and a half the junior of Pablo, we felt like Paloma would live forever. She was going to be the ugly old toothless Pug that lived to be 17. While visually, she had aged a lot in recent years, she still got around like a puppy. She had a vigor that Pablo's quiet aloofness could never match. She was the barker. She was the one wanting to 'meet' all the other dogs but then would roll onto her back in submission. Pablo was just too good for that, too much of a loner to care. Paloma was a social butterfly, or so she wanted to be. Our vision of the life our old dog was going to lead changed suddenly last week. Paloma died in my arms as we were trying to rush her out the door to the vet. At 12-1/2 years old, we shouldn't have been surprised, but after watching Pablo's slow decline over the course of years, we were shocked that she passed so quickly. Paloma was fine in the morning: eating, drinking, climbing stairs; then in the afternoon: shuttering, gasping and gone. So suddenly. We have such an emptiness in our hearts. After nearly 14 years of having dogs in in our lives, the changes in routine and in looking for the pitter pat of little doggie feet to greet you are the hardest. Pablo and Paloma were great dogs, not perfect, but they were ours. They gave us unconditional love and we gave them a forever home, even though that home changed a few times. We miss our two babies-before-our-human-babies and will be forever grateful that they took this crazy international adventure along with us. Besos a ustedes dos, Pablito y Palomita!!! Los queremos y los extrañamos mucho! Great news that Pablo, our 8 year old male Pug, is on the mend. We had a vet visit yesterday, along with medication delivered today and all should be better soon. Brad can write more at some point about his vet adventures. 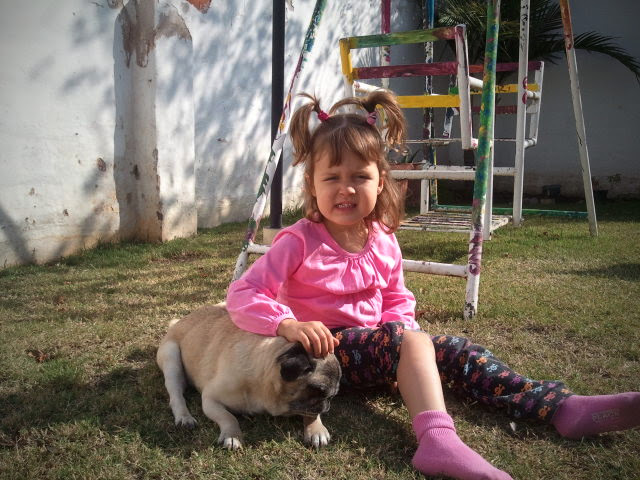 I also have to mention that Paloma, out female Pug turned 7 today. Happy Birthday!! As you can tell by the photo above, the days festivities were exhausting and they found a comfy spot on a flattened box to rest. This afternoon we had a bittersweet lunch with friends who will be leaving UY today to head back to MN. While they are planning to return here next year, we probably will not see them before then and miss them already. Jim and Mariellen had a wonderful experience here and are definitely planning UY as their retirement destination! Yippee!! At the tail end of our lunch, I had to leave a bit early because Ms. G was in dire need of a nap. I took her back home (which was about a 1/2 block away) and put her to bed. I then prepared coffee for everyone to come back and enjoy once they were done with the bill and the last bit of wine at the restaurant. 15 minutes had passed. 30 minutes had passed. Still no sign of them. 40 minutes after I left the restaurant, they get back here. Turns out that the bill was paid and then the waitress brought two BIG carafes of wine, on the house. That was certainly unexpected and I was more than a bit envious that I missed out. We talked some more and had a quick 20 minute coffee (Record time in UY!) in our back courtyard before the landlord and Jorge were scheduled to arrive. Jorge and the landlord get here. We say our goodbyes to Jim and Mariellen (who have to get to their hotel and then off to the airport ) and we are off to talk about the water issues. The landlord lived in this house for 4 years and is familiar with the systems. He says that the water pressure can build up in the system overnight and that causes leaks where there are not normally leaks. For the next few days, he is asking us to turn the water off at night until they can get the system repaired. Not a big deal and we are happy to do so if that will prevent more water. The kitchen cabinet need to be dried out (we have some stuff to absorb the moisture) and then bleached. I don't like bleach, but if it can kill the nasties, I'm all for it. The atmosphere was all very comfortable and they came prepared to hang up a clothes line while here (we already did that a few days ago) and silicone the shower fixture as we had requested. We also got the assurance that all was going to be made right and received the landlords phone number and address (he lives right around the corner) and then an invitation to come to his house to pick up a tricycle. His daughter is 3 and had graduated to training wheels. He thought that we might like it. Geneva thinks it's fun to push it and walk while straddling it, but hasn't gotten the concept of riding get. It'll come. All in all, a much better day than yesterday. A vet visit (along with a husband who's Spanish is good enough to handle a vet visit) great lunch with friends and a responsive and helpful landlord all make for a very happy Lisa!